After a two-month hiatus, Scandal has finally returned, and as far as the plot is concerned, we don't know much more than we knew at the end of the winter finale: Olivia Pope was kidnapped to compel Fitz Grant to declare war against West Angola. But as we know, it's about the journey, not the destination. Well, Shonda Rhimes, thanks for the ride! Scandal fans have grown accustomed to particular Scandal conventions, like fast-talking gladiators slapping headshots against the wall in the Pope & Associates war room. For this episode, however, Rhimes and director Tom Verica teamed up to serve us something off the menu, complete with dream sequences and footage played backward, and it resulted in one of the most engaging Scandal episodes thus far. In a nutshell, Olivia is snatched from her apartment and taken to a hostage-holding camp in what she believes to be a foreign country. After days of captivity, Olivia begins hallucinating about Jake rescuing her … so that she can live happily ever after with Fitz. During this dream sequence, however, Olivia's inner survivor pops up in the form of Abby Whelan to let her know that no man is going to rescue her. She has to save herself. So Olivia uses the underwire from her bra to unhook a pipe in the bathroom and bash in the head of one of her captors. Way to go, bra! To quote NBA star Kevin Durant, "You the real MVP." Olivia ultimately overcomes both of her captors, only to find out that she's been held hostage on a local soundstage the whole time, and the meal they'd been serving her for lunch every day was just Panera's new quinoa bowl that they had picked up around the corner. This episode also introduces us to Olivia's kidnapper, Ian, the new bad guy in town. I assume he's in cahoots with Vice President Andrew Nichols and Republican National Chairwoman Elizabeth North on this kidnapping plot, but it's too soon to tell. Olivia had the majority of this episode to herself, and it was a real treat to watch actress Kerry Washington demonstrate her range as Olivia transitioned from self-possessed fixer to raging survivalist. 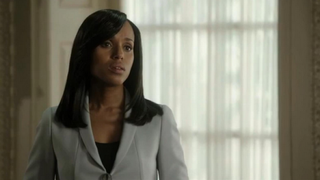 I also loved watching Olivia's usual bone-straight tresses transition over the course of the episode. With some shea butter and a side part, Olivia could have set Instagram on fire! However, after having Olivia to ourselves for an hour, we discover that Olivia is lacking in some basic survival skills. 1. Lock your doors. Someone is always looking for Olivia, and apparently, everyone knows where she lives. I'm on Google Maps looking at the street view of her apartment right now. Use the dead bolt, Olivia. It probably won't save your life, but you don't have to make it so easy for people to get to you. 2. Squat. You're really going to trust some two-ply to protect you from that toilet seat? See now, this serves as evidence that technological advances aren't making us smarter. Remember, like, five years ago, before toilet-seat covers were available in every public bathroom stall and your mother had taught you to squat whenever you use public restrooms? "The squat" would have served Olivia well in fake hostage camp. 3. Not everyone is your friend. Within days of meeting her cell mate, Ian—who turned out to be a kidnapper who was trying to gather intel from her—Olivia let him know about a potential tracking chip inserted under her skin and that the president was going to rescue her. Hush, child. 4. You can't save everyone. Ian told Olivia that he had been held hostage for days, maybe even weeks, but he barely had a five o'clock shadow. Hmpf. I would have been ready to trade him in for a pack of cigarettes, and I don't even smoke. But as soon as Olivia landed in the cell, she decided that it was her job to save not only herself but also Random Guy whom had she just met 12 seconds before. Chill, Moses. 5. Always take the gun. First, I'm not surprised that Olivia shot her captor point blank in his forehead. She almost killed her father in the last episode, which proves to me that she's capable of almost anything. But after she killed him and grabbed his keys, she left the gun behind. Seriously?! She was planning to roam the streets of Afghanistan or wherever she thought she was without a gun? Her plan was just to yell, in English, to anyone she passed, "Please call the president of the United States! He's my boyfriend!" Oh, I see. Olivia Pope is obviously a boss, but it's clear that Mama and Papa Pope dropped the ball in some key areas.